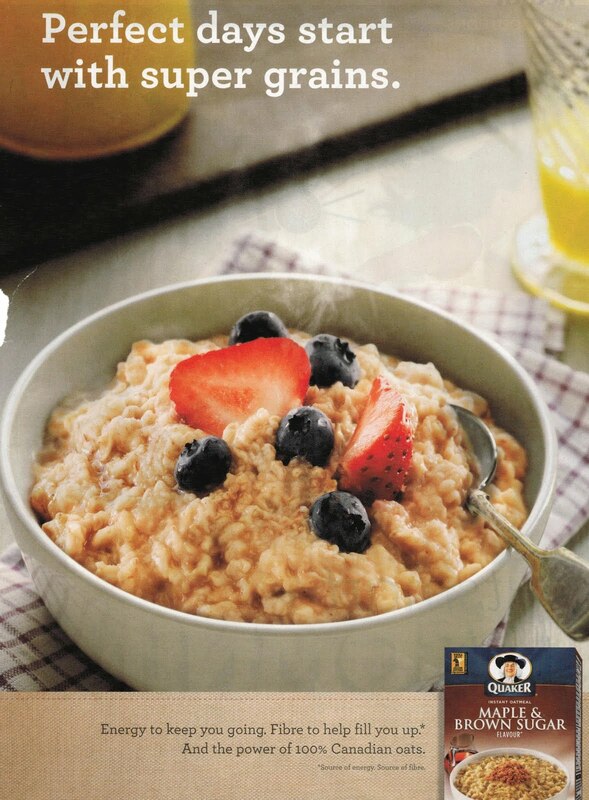 Weighty Matters: Badvertising: Quaker Oatmeal's Super Grains? Badvertising: Quaker Oatmeal's Super Grains? I know you've heard of super fruit (even though there's no such thing), but have you ever heard of "super grains"? I hadn't, at least not until I saw this badvertisement for Quaker Maple and Brown Sugar Instant Oatmeal. So what's in a packet of this stuff? About the same amount of fibre as a slice of whole grain bread along with 3.5 teaspoons of sugar (and that's before you add any of your own). Biggest Loser MD Deluded, Unethical or Clueless? Saturday Stories: A's, POM and Apps! Are Public Drinking Fountains Disappearing? Have You Ever Experienced a Post Race Day Bonk? The Truth? Healthy Living Requires Effort. Sometimes it's Good to be a Quitter!